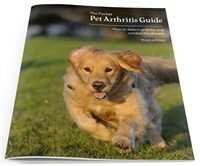 The Pocket Pet Arthritis Guide Booklet Version III is a great valuable reference for all pet owners to have. It offers an in depth guide on how to detect pet arthritis and ways to combat the disease. The book is filled with great images and useful graphs and diagrams to make it easier for pet owners to pinpoint problematic areas. Grab your copy today and find out what key ingredients to look for in treatments!